Is upgrading to a bigger home just a pipe dream these days? 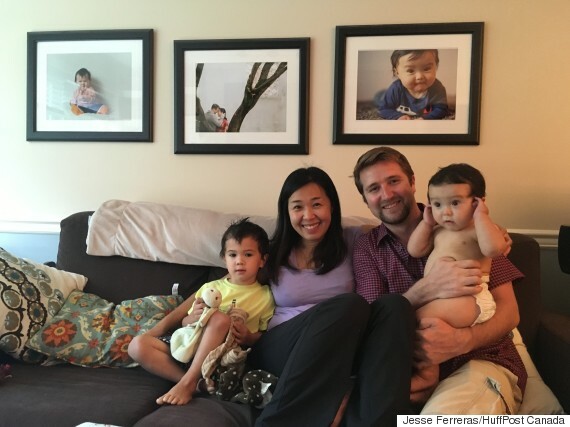 Matthew and Vanessa Pitcairn are fast outgrowing their apartment in the Vancouver suburb of Richmond. Matt was born in the city. 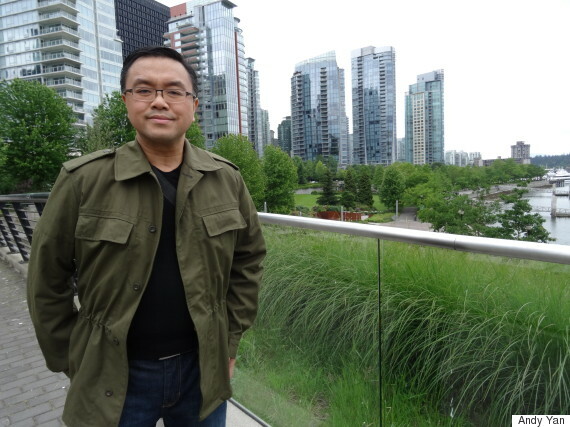 A fixture in the community, he works for the local chamber of commerce and ran for school board in 2014; Vanessa, who works for the city, moved to Richmond from Hong Kong when she was three years old. 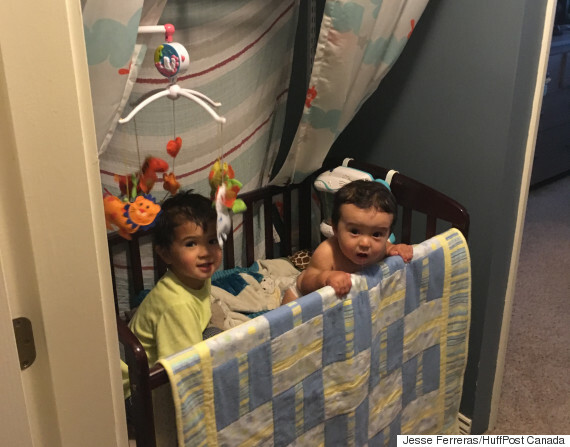 They live in a two-bedroom, 800 sq.-ft. unit they bought in 2013 with their sons Landon, three, and Sawyer, who's 11 months old. It's a beautiful ground-floor apartment, where they keep a garden and are steps away from a playground and a recreational facility that was used in the 2010 Winter Olympics. They jumped into the housing market with the hope that they could upgrade in about five years. But three years in, the place is becoming a tight squeeze. Landon has his own room. But Sawyer sleeps in a crib, tucked into a hallway closet on the way to an ensuite bathroom. Matt and Vanessa have searched aggressively for a new home for the past three months, but even far-flung areas of the region with more challenging transit access, are proving too expensive. 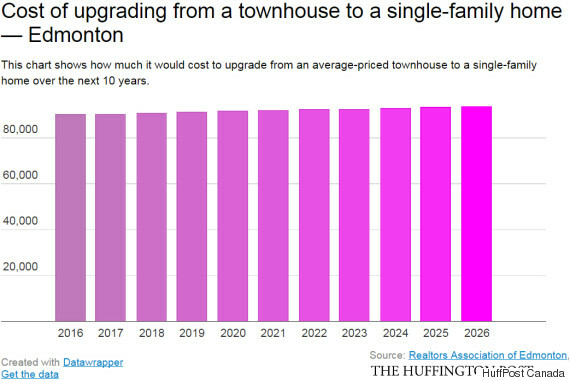 "Most of Richmond, we're already priced right out of it," Matt told The Huffington Post Canada. The family is now considering the possibility of leaving the city they've called home for most of their lives. And they're not alone among families in Greater Vancouver. 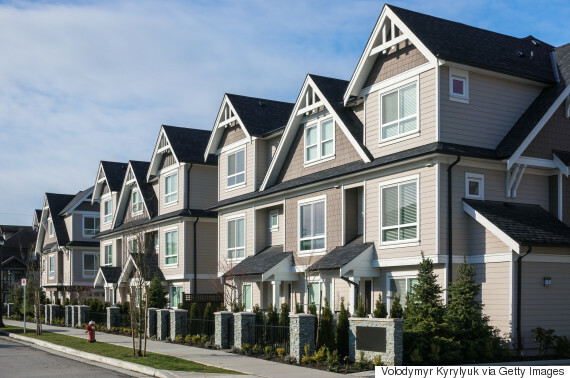 Data gathered by The Huffington Post Canada shows that numerous families around the region are set to have serious trouble moving to more spacious housing over the next decade — let alone enter the market in the first place. A simple look at the projected cost of upgrading from a condo to a townhouse suggests the task could be impossible for certain buyers over the next decade, if prices keep growing as they have over the past three years. 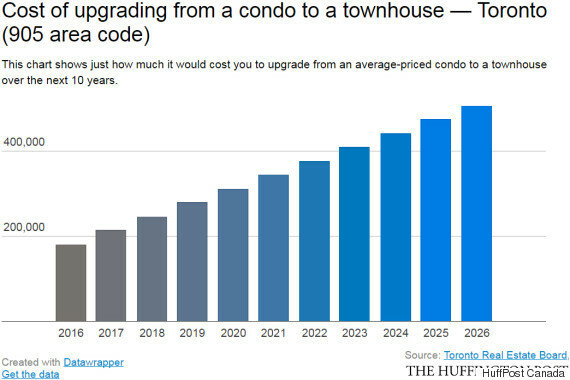 This year alone, it would cost a condo owner an extra $147,000 to buy a townhome. That means the unit would have had to have gained almost $150,000 in value (and sell for that much) to buy a bigger home without taking on more debt. The problem is only set to worsen in future years. 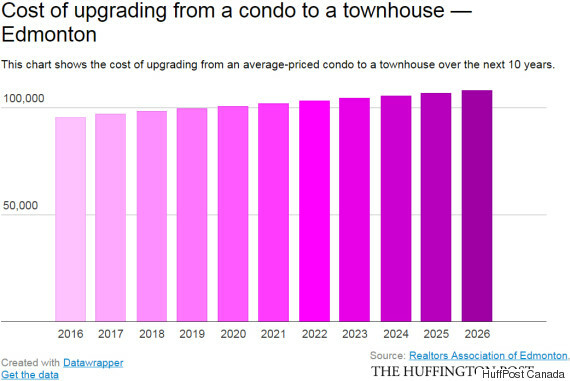 In 2017, the gulf between the cost of a condo and a townhouse is projected to hit $166,767, before reaching $341,067 in 2026. 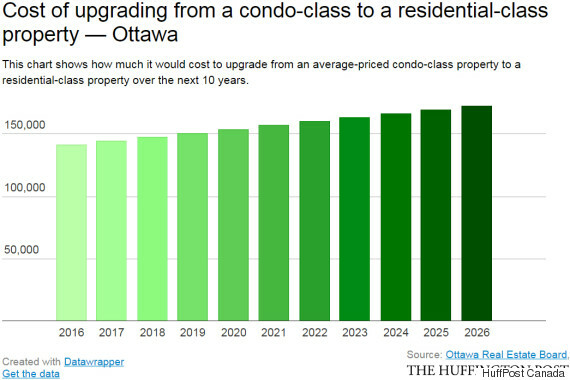 In other words, condo owners are likely stuck where they are. 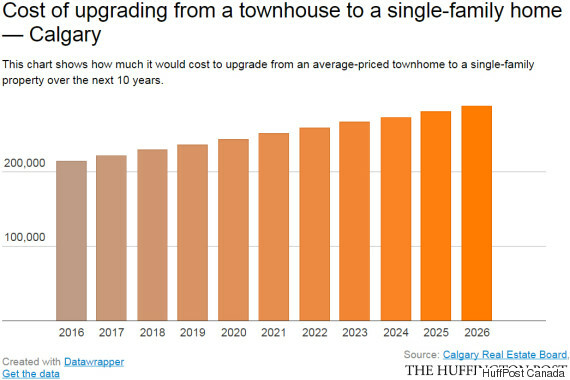 But owners of townhomes have it even worse. 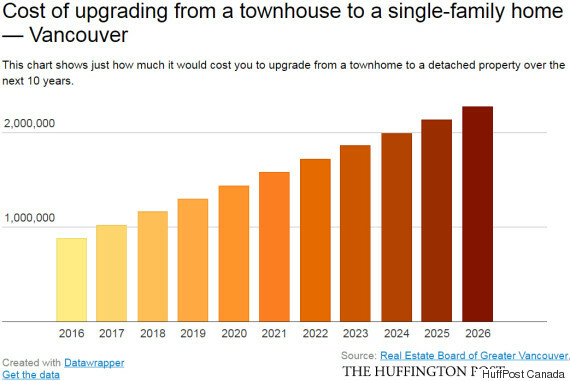 The current cost to upgrade from one of those units to a single-family home is $881,400. 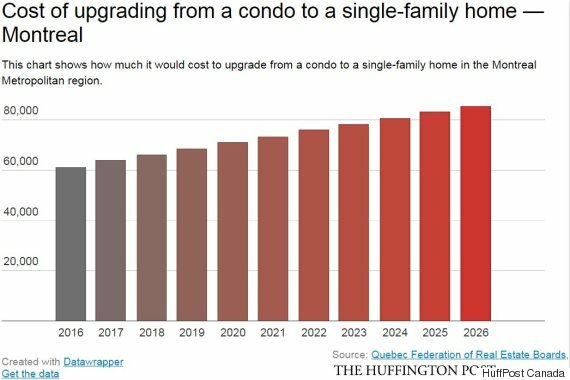 Data projections show it could be $2,278,397 by 2026. "It looks like the ladder of housing mobility has been broken," Andy Yan, acting director for the Simon Fraser University City Program, said of the trend. A planner by trade, Yan has long examined affordability issues in the city. One of his best-known projects is a series of maps that show the dividing line in Vancouver between areas with single-family homes worth $1 million, and those that fall below that. More recently, he discovered that that line has all but disappeared, replaced by a $2-million line. 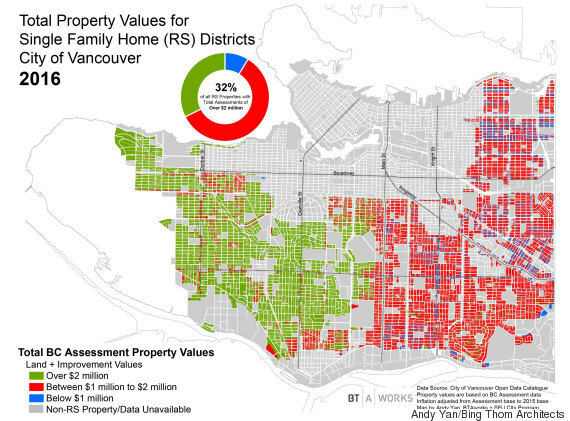 Slide left for what Vancouver single-family home values looked like in 2015. Slide right for this year. Yan fears a number of outcomes if housing upgrades remain out of reach. The first is overcrowding — a phenomenon that is already materializing in areas like Vancouver's east side, where he says there's a "deficit of bedrooms." But he also worries that neighbourhoods that have traditionally housed families are essentially being hollowed out, leaving "hundreds of millions of dollars" of unused infrastructure, like schools. Andy Yan fears a number of outcomes if housing upgrades remain out of reach. Indeed, 12 schools have been recommended for permanent closure in Vancouver — most of them concentrated in the city's less affluent east side. That phenomenon is also emerging in Richmond, where as many as 16 schools are being considered for shutdown. Yan sees a possible solution in "family-oriented densities" in areas with amenities like schools. It's a concept he considered while serving on the Vancouver Mayor's Task Force on Affordability, and it involves changing zoning in certain neighbourhoods to emphasize a mix of family housing, such as multi-unit buildings. "We're not really talking about wholesale rezoning, we're talking about a much more considered process of densification," Yan told HuffPost Canada. Vancouver's not the only city grappling with a broken property ladder. 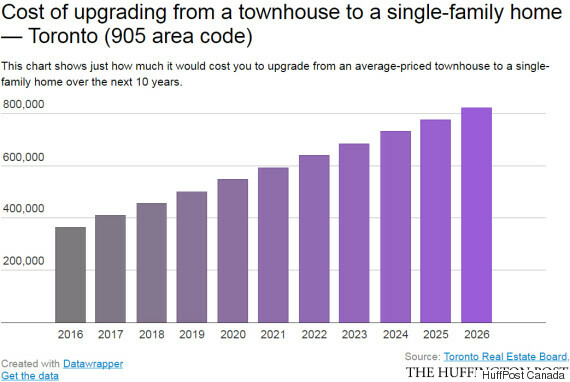 The problem is actually worse in Toronto when it comes to upgrading from a condo to a townhouse. The cost of upgrading in the 416 area code alone is $183,785 this year. It could grow to $214,712 next year, eventually reaching $493,055. And climbing the ladder in the 905 area code isn't much easier. There is, of course, plenty of uncertainty about how long such a trend can continue. Greater Vancouver housing sales dropped almost eight per cent last month, with a palpable decline among detached homes. Prices, however, have yet to adjust. For now, the Pitcairns will keep looking for a bigger place to live. They're considering buying a home with Vanessa's parents. That arrangement would see both couples sell their properties so that they could live together in a two-storey home. But that's proven difficult in Richmond, where many such older, more affordable homes have been torn down. The Pitcairns wonder how far they'll have to go to live comfortably as a family. And whether they'll feel like they're part of a community wherever they do. "We are in that sandwich generation where we have the privilege to experience that neighbourhood feeling, so that's why we want that for our kids too," Vanessa said. "But it is now becoming out of reach, and that's the tough part." The Huffington Post Canada drew up its data by looking at information from real estate organizations in six Canadian cities: Vancouver, Calgary, Edmonton, Toronto, Ottawa and Montreal. The data took average and benchmark prices for homes in those cities in the month of May in 2013, 2014, 2015 and 2016. Average annual increases were derived from these years to provide a projection for what home prices could look like in a decade. 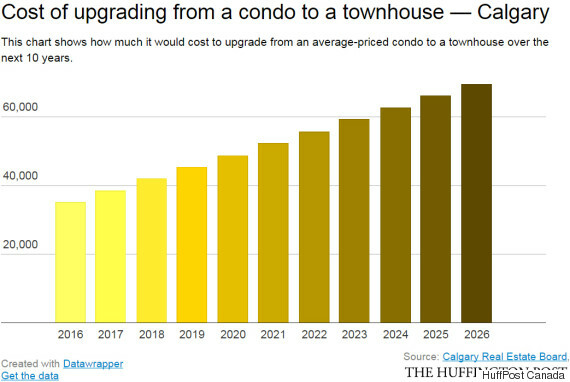 The cost of upgrading from a condo to a townhouse was projected by subtracting the cost of the latter from the former. The same process was followed for the cost of upgrading from a townhouse to a single-family home. These trends don't account for developments such as an interest rate hike, nor any possible new regulation by the federal government, or a crackdown on capital outflows from China. They merely show how difficult buying conditions could be for residents in these cities if nothing changes.